Ooooo...it looks so pretty! I'd love to make some...where do I find citric acid in a Japanese store? What do I need to ask for--the pronunciation please? Gomen, I'm such a stranger to foreign flavours: what does it taste like? 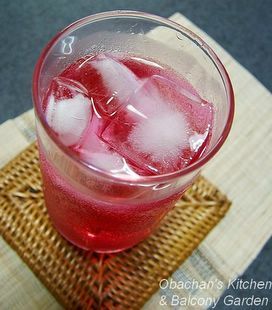 Oh I love Shisho, and I think I would love this drink! I will have to save it for later, as my shisho has performed dreadfully this year. Hmmm have to see if Mom has any left! i am suddenly intrigued by your term 'after-bath drink', is it a popular practice in Japan? what other after-bath drinks are there? it sounds delightful!! It’s called クエン酸 (kuen san) in Japanese. I guess you can find it at a big supermarket or baking ingredients shop, but if not, the best place to go is a drug store. It’s white powder. Like I wrote in the post, mom’s way is a little different. 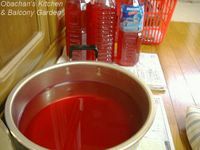 I found a couple of “standard” recipes on the net when I googled with “shiso juice,” and they don’t require soaking the leaves overnight. You mean citric acid? Shiso? Citric acid is supposed to taste sour. And shiso… Mmmm…I don’t know how to describe it. It is refreshing and minty, in a sense, but not exactly like mint. The drink tastes sweet and sour. If you like shiso, I think you like this drink. I don’t like too much shiso flavor, so I liked the version my mom made this year. 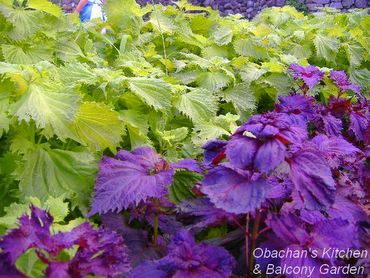 Since her shiso grew too big because of the fertilizer, it became a little flavorless. So mom’s drink didn’t have strong shiso flavor like it did last year, and I liked it that way. Well, I don’t know if they really call it “after-bath drink” but I guess good many people do drink something cold after taking a bath. It’s no surprise because usually we soak in the tub filled with rather hot water, so we get pretty hot and thirsty. Popular drinks may be beer, isotonic drink and … could be milk? Oh, that reminds me. It used to be a popular practice to drink fruit-flavored or coffee-flavored milk (bottled) after taking a bath at a public bath house in Japan. When I talk about this with someone around my age or older, I often get "OH! Yeah! I did that, too!! Oh I miss that fruit-flavored milk!" kind of response. Hi Obachan, the leaves are beautiful! 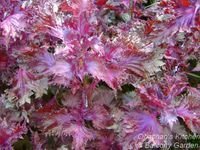 I've never seen such rich purple and pink coloured leaves before! We only have green green and green here. Would the shiso drink taste bitter if it's only soaked by itself? How about add some lemon to it? i envy you again because it is difficult for us French to find some shiso , may be i should grow some next year ? what do you need for soil , sun ? , water ? lot'of ? 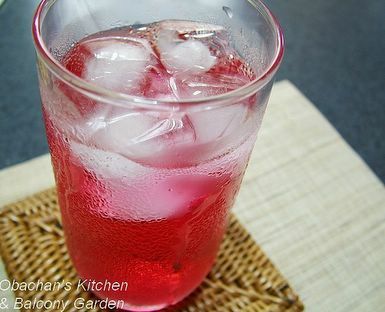 I would never make this drink without adding citric acid or lemon. (Lemons contain citric acid anyway.) Oh, and certain amount of sugar. I’ve heard that shiso is a pretty care-free plant to grow. But the ones I grew in my balcony garden always suffered some kind of disease, so I guess it doesn’t like too much heat and humidity. How about taking a look at this site?? Fascinating! I've never heard of using shiso this way, thanks. Also great to see the photos of your mom's shiso jungle -- hehe. I grow Korean shiso at home during the winter (it's the only time cool enough here for them) so it was an interesting entry for me. Thanks, Obachan! Yeah, I remember your Korean shiso. I wonder what Korean shiso drink would taste like. Thanks for a great post and pictures. Will enjoy browsing through your archives. Oh, shiso drink! I remember seeing that when I lived in Japan. My friend's grandma who lived out near Takayama made it. I did find it quite strong. I don't know about how things are in Kochi, but I know that many of my friends and I drank milk tea or strawberry milk after going to the bath house, or after visiting onsen. I love your site - it reminds me of good memories from when I lived in Japan, and from my childhood. Why don't you move to Japan? I heard that "fruit gyunyu(milk) after taking a bath at a sento" was the "classic" style. I have never tried it myself, but looks like some people do make shiso-infused liquor here in Japan. I found several different methods on the net, but basically, for aojiso (green perilla) infused liquor, they seem to use Japanese distilled spirit called "shochu" (alcohol content 35%), crystal sugar and green shiso leaves. Some add sliced lemon and/or honey, too. Some said "Take out the shiso leaves after a week," others said three months. Most of them said that the longer you let it mature (after taking out the leaves), the milder it tastes. so I guess it can't be helped. It may make a difference used different liquor and added lemon, but still I doubt if it would keep the green color of the shiso leaves. 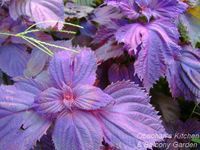 The Japanese sites I found said that shiso liquor suppresses cough and has a diuretic effect. (But they were all hearsay, so be careful.) I don't know any negative properties. It looks so pretty and I think I would love this drink! The shiso spirit was quite... awful when I first tried it... (beside the color) - so I sort of forgot about it for nearly one year... The other day, I was cleaning the liquor cabinet and found it... decided to try it... well... it had smoothed down a lot, and was quite... nice actually. And yes, it does stop caughing... amazingly efficient... Now... since it is made with real alcool... and very little added syrup (I am watching my sugar level)... it is still - strong - so no abuse here... But it is good !